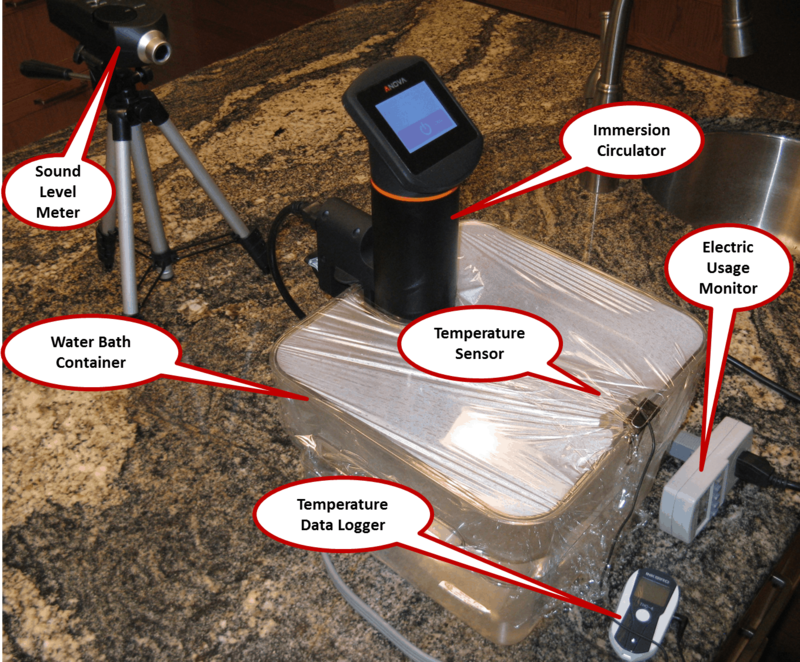 Check out all the sous vide machine benchmark information you've been curious about. With the wide range of sous vide machines available there are definitely differences in performance. Here is our look at how all the various machines respond to a specific set of tests. Note: For a recap of the results on all of the units tested, you can read our sous vide benchmark results article. 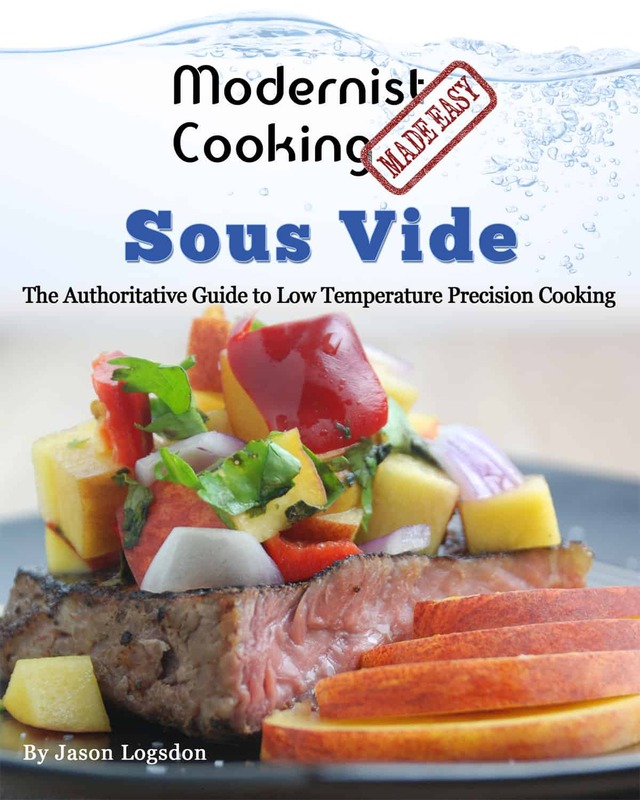 As I have performed detailed reviews on numerous sous vide machines I thought it would be informative to have some objective information regarding their performance. So I decided to define a benchmark that I could put each sous vide machine through and gather some useful information regarding its performance. Note: To view an up-to-date list of the machines we have tested you can check out our sous vide benchmark results. I was most interested in monitoring the water bath temperature over time given a few different scenarios. But I also took a couple of sound and power consumption measurements as well. This is far from a complete analysis but it will provide some information that I hope you will find useful. 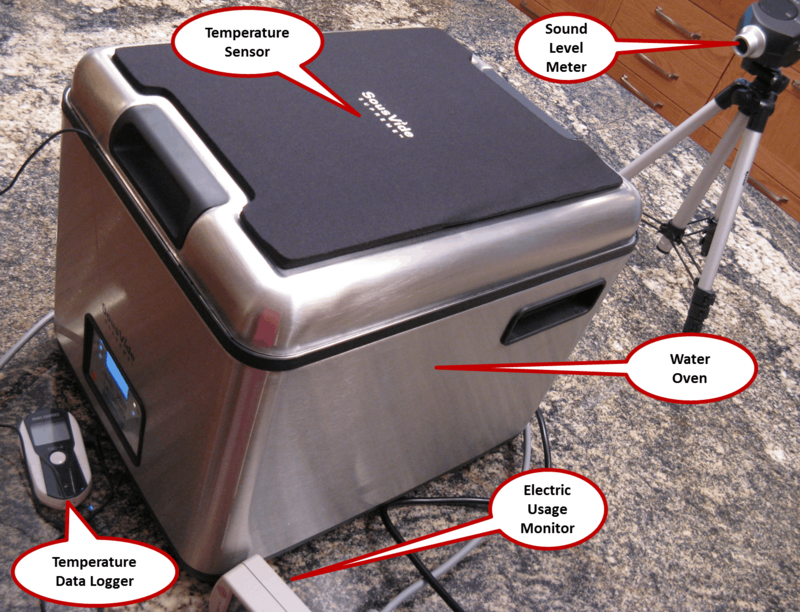 This post is quite lengthy since I felt it was important to describe in detail how the Sous Vide Machine Benchmark was created and executed. However, if you are just interested in the results of the benchmark you can link directly to the Sous Vide Machine Benchmark Results section at the end of this post. I will admit up front that this Sous Vide Machine Benchmark does not have the rigor suitable for a scientific journal. However, I did try to make it as "fair" and repeatable as possible given the amount of time and expense I was willing to invest. So please keep in mind that small differences between the performance of the various machines being benchmarked may, or may not, be statistically significant. The idea was for the benchmark to model typical sous vide cooking actions. I decided to use a scenario where you may be cooking two different types of items for a single meal. The first item would be something like chicken or a medium steak, which would cook for a longer time at a relatively low temperature. Once this was done you would raise the temperature of the water bath significantly in order to cook an accompanying vegetable such as asparagus or broccoli at a high temperature. As you can see from the figure above the Sous Vide Machine Benchmark typically lasts two hours. During the first hour the water bath is heated from room temperature of 75°F (23.89°C) to a low temperature of 140°F (60°C). This is a temperature typically used for cooking things like chicken or medium steaks. The time to reach this low temperature is referred to as the "Room Temperature Startup Time". During this startup time two sound measurements are also taken of the sous vide machine. Often when starting a sous vide cook you may be filling the bath direct from the hot water tap. This water is normally around 125°F (51.67°C). The time required to get the water bath from this temperature up to the low temperature is referred to as the "Hot Tap Startup Time" and is obviously shorter than the "Room Temperature Startup Time". Once the low temperature is reached it is maintained for the remaining portion of the first hour. The temperature is tracked during this time to determine any variation. Also at the end of the first hour the total power consumption is recorded in kilowatt hours (kWh). At the beginning of the second hour the water bath target temperature is set to 183°F (83.89°C). This is the temperature required to sous vide most fruits and vegetables. The time required to raise the water bath from the low temperature to this higher temperature is referred to as the "Temperature Rise Time". Once the high temperature is reached it is maintained for the remaining portion of the second hour and tracked to determine any variation. Also at the end of the second hour the total power consumption is recorded in kilowatt hours (kWh). 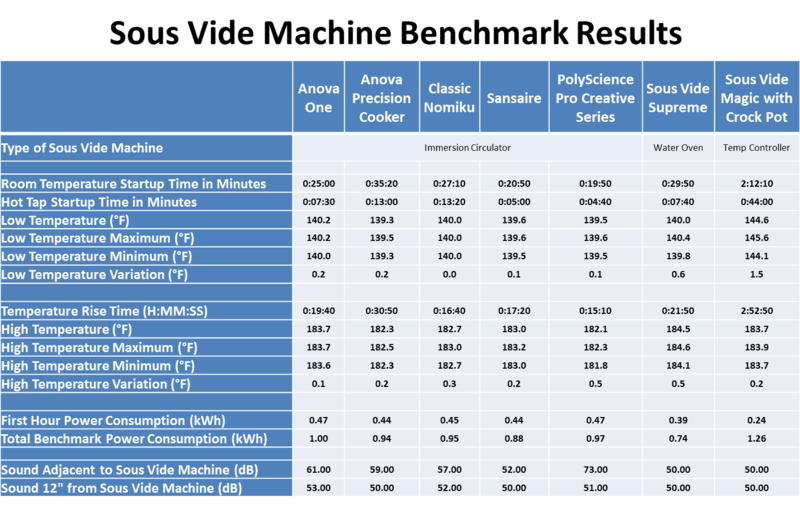 The measured and calculated results from the Sous Vide Benchmark are summarized in the table below. The definition of the various parameters and how they are measured or calculated are covered in detail in the remaining portion of this document. Note: For an up-to-date look at the results of our latest tests, you can read our sous vide benchmark results article. In setting up the benchmark my goal was to make it applicable to as many different types of sous vide machines as possible. This will include immersion circulators, water ovens, temperature controllers and miscellaneous units such as the GE Paragon. When initially creating this Sous Vide Benchmark I planned to have a "Recovery Scenario" as part of the benchmark. 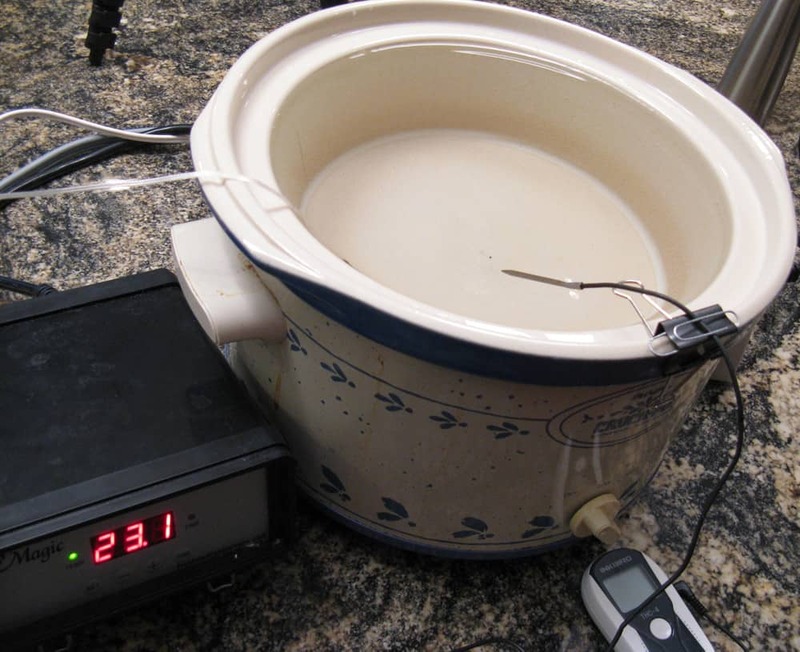 My thought was to essentially model putting a large frozen protein, such as a chuck roast, into the water bath to see how long it would take for the water temperature to return to the target temperature. I tried numerous items in order to model the frozen protein including: a Ziploc bag containing a large chunk of ice, a large block of metal that was frozen and finally a 3 lb (1.36 kg) chuck roast. Much to my surprise, the impact on the water bath temperature was very minimal. The water bath temperature only dropped around 6°F (~4% of the target) and fully recovered to the target temperature in approximately 10 minutes. Given the typically long cook times of most sous vide dishes this minor perturbation would not impact the quality of the dish in any way. Consequently, I decided not to include this recovery scenario in the benchmark. The details of the Sous Vide Machine Benchmark setups are given below for each type of sous vide machine. The picture below shows the set up for benchmarking immersion circulators. You can refer to it as I described the various items in the picture. I chose to use 8 L (2.11 gals) of water for the benchmark. I selected this amount because it is about how much I typically use for the majority of my sous vide cooking. But more importantly, it is well within the capabilities of all the immersion circulators, and in addition all of the leading water ovens have enough capacity to hold this volume of water. To be as consistent as possible for each benchmark executed I chose to weigh the amount of water used. Therefore, I weighed out 8 kg (17.64 lbs) of water, which equates to the 8 L (2.11 gals). For executing the Sous Vide Machine Benchmark on immersion circulators I am using my Camwear Polycarbonate Square Food Storage Container as the water bath container. This holds the required amount of water and all immersion circulators can be easily attached to this container. During the execution of the benchmark I cover the top of the water bath container with Stretch-Tite plastic food wrap to help keep in the heat. This is not as energy-efficient as the custom lid I usually use when sous viding but it will provide a nearly identical environment for each immersion circulator that I benchmark. In order to track the temperature of the water during the benchmark I place the temperature sensor on the side of the water bath container across from the immersion circulator. The remote temperature probe sticks into the water approximately 2" (50.8 mm). I felt that by placing the sensor as far as possible from the circulator it would be impacted by how effectively the unit being benchmarked circulated the water in the container. The picture below shows the set up for benchmarking a water oven. You can refer to it as I described the various items in the picture. 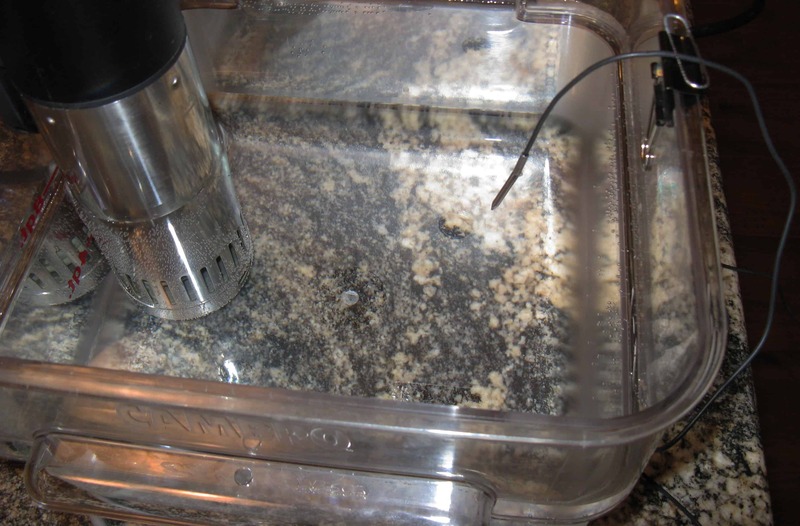 A water oven has the "water bath container" integrated into the single unit. The capacity of different water ovens varies, but most will hold at least the 8 L (2.11 gals) of water for the benchmark. During the execution of the benchmark I cover the top of the water with the lid included with the water oven to help keep in the heat. In order to track the temperature of the water during the benchmark I placed the temperature sensor as close to the center of the water bath as possible. The remote temperature probe sticks into the water approximately 2" (50.8 mm). 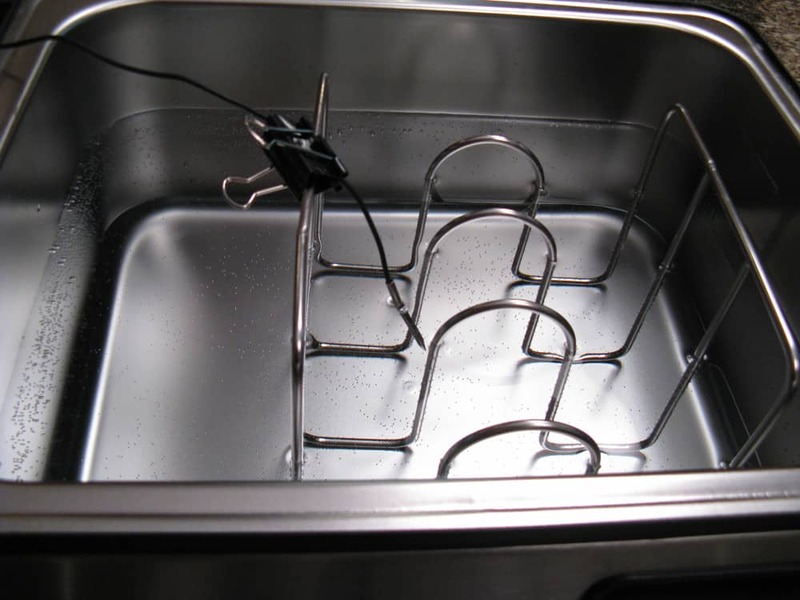 I included temperature controllers in the Sous Vide Machine Benchmark for early adopters like Jason, me, and perhaps you, who ignited our passion for sous vide cooking with a rig similar to this. We thought we were pretty hot stuff using our slow cookers or rice cookers to get our feet wet in this emerging new technology. By including the performance numbers of this setup we can really appreciate how far we've come in a relatively short time. I hope you enjoy the historic perspective this scenario presents. The picture below shows the set up for benchmarking a temperature controller. You can refer to it as I described the various items in the picture. A temperature controller can be connected to a variety of appliances such as slow cookers and rice cookers. For this benchmark I used the 4 Quart Crock Pot I started out using. Most slow cookers and especially rice cookers are much smaller than today's sous vide machines. When executing this benchmark I was only able to use about half of the 8 L (2.11 gals) of water specified for the benchmark. Obviously, this skews the results, but they are so outlandish it really doesn't matter. During the execution of the benchmark I cover the top of the water with Stretch-Tite plastic food wrap to help keep in the heat. There are a number of temperature controllers available in the marketplace targeted for use in sous vide cooking. I used a relatively early version of the "Sous Vide Magic" controller introduced by Fresh Meals Solutions in 2007. Early on these were by far the least expensive and most accurate way to get into sous vide cooking. They work by simply monitoring the temperature of the water bath and cycling the appliance on and off in order to maintain the target temperature. In order to track the temperature of the water during the benchmark I placed the temperature sensor near the edge of the water bath. The remote temperature probe sticks into the water approximately 2" (50.8 mm). I use three different instruments to take measurements during the Sous Vide Machine Benchmark. They are described in the paragraphs below. 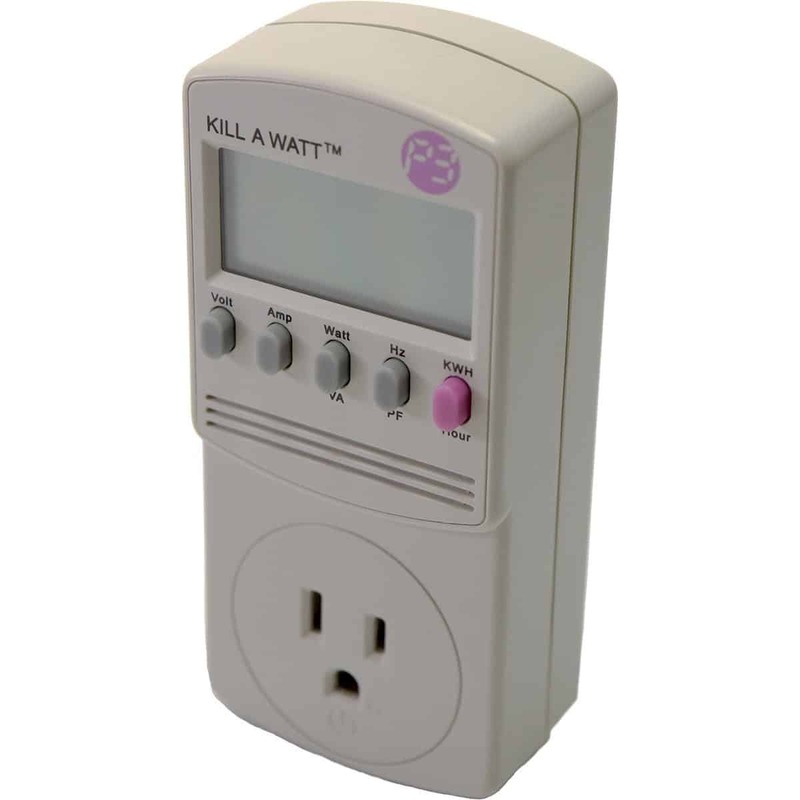 For monitoring the power usage I used the P3 P4400 Kill A Watt Electricity Usage Monitor . This unit can measure numerous electrical parameters associated with the device which is plugged into it. For the Sous Vide Machine Benchmark I only used it to record the overall power consumed by the unit being benchmarked in kilowatt hours (kWh). I took two kWh measurements during the execution of the benchmark. The first one after the first hour and the second after the second hour, i.e. at the end of the benchmark. To measure the noise generated by the sous vide machines I pulled out a RadioShack sound level meter that I had purchased quite a while ago in order to find tune my surround sound system. This was probably the least accurate of the three measurement devices. It is analog and has a specified accuracy of ± 2 dB. I made two sound measurements during the startup phase of the benchmark, one adjacent to the sous vide machine, and the second 12 inches away. For each sous vide machine that I ran the benchmark on I report on 15 data points which are either measurements or calculations. Each of these is described briefly below. During the first hour of the benchmark the water bath is heated from room temperature of 75°F (23.89°C) to a low temperature of 140°F (60°C). This is a temperature typically used for cooking things like chicken or medium steaks. The time to reach this low temperature is referred to as the "Room Temperature Startup Time" (See graph above). Often when starting a sous vide cook you may be filling the bath direct from the hot water tap. This water is normally around 125°F (51.67°C). 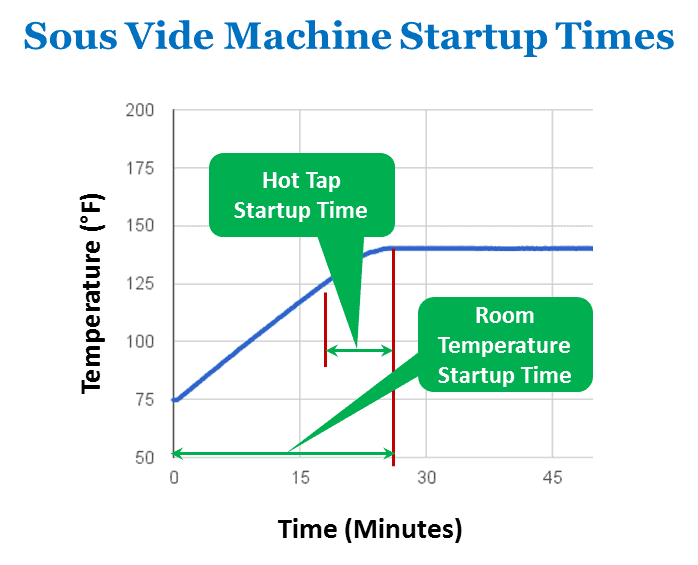 The time required to get the water bath from this temperature up to the low temperature is referred to as the "Hot Tap Startup Time" and is obviously shorter than the "Room Temperature Startup Time" (See graph above). During the first hour of the benchmark the sous vide machine target temperature is set to 140°F (60°C). 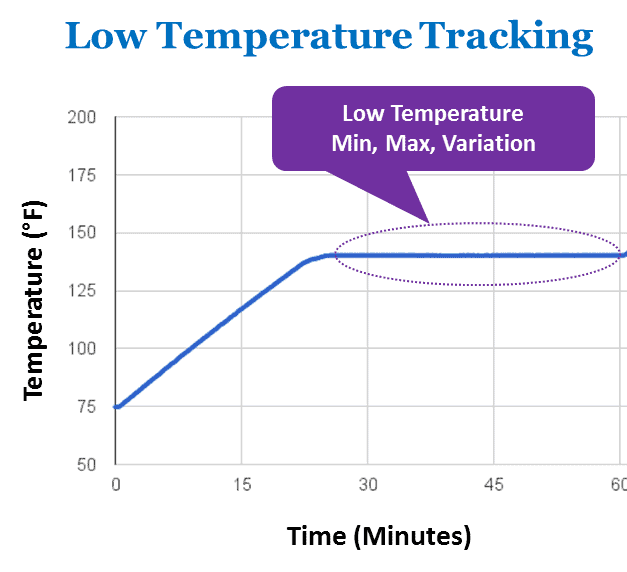 This data point indicates the temperature recorded on the temperature logger for Low Temperature. Often this temperature varies slightly from the 140°F target temperature. Once the Low Temperature has been reached the temperature is tracked for the remaining portion of the first hour. This data point indicates the highest temperature recorded during the Low Temperature Tracking period. Once the Low Temperature has been reached the temperature is tracked for the remaining portion of the first hour. This data point indicates the lowest temperature recorded during the Low Temperature Tracking period. Once the Low Temperature has been reached the temperature is tracked for the remaining portion of the first hour. This data point indicates the variation in temperature during the Low Temperature Tracking period (See graph above). At the beginning of the second hour the water bath target temperature is set to 183°F (83.89°C). This is the temperature required to sous vide most fruits and vegetables. 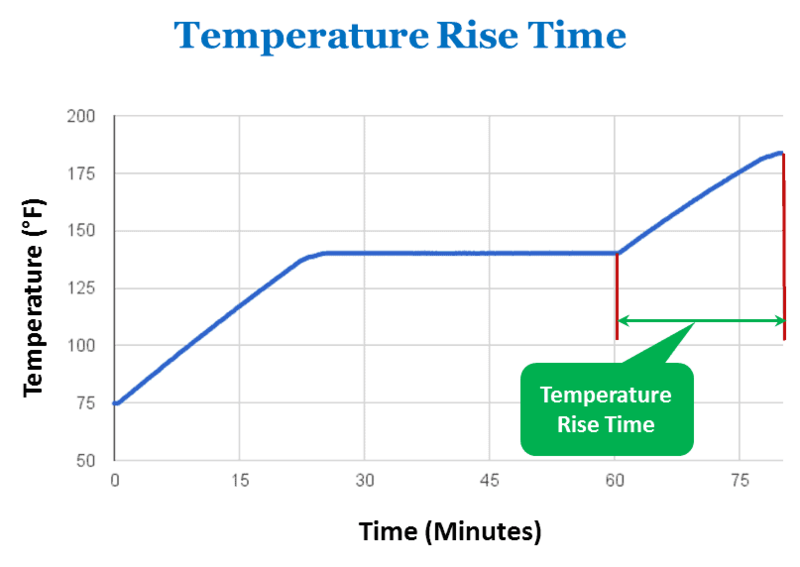 The time required to raise the water bath from the Low Temperature to this High Temperature is referred to as the "Temperature Rise Time" (See graph above). During the second hour of the benchmark the sous vide machine target temperature is set to 183°F (83.89°C). 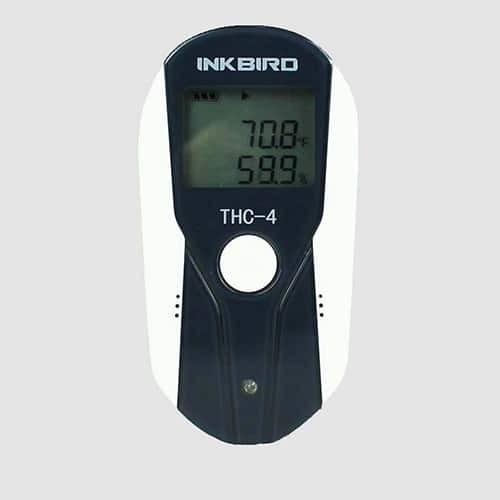 This data point indicates the temperature recorded on the temperature logger for High Temperature. Often this temperature varies slightly from the 183°F target temperature. Once the High Temperature has been reached the temperature is tracked for the remaining portion of the second hour. This data point indicates the highest temperature recorded during the High Temperature Tracking period. Once the High Temperature has been reached the temperature is tracked for the remaining portion of the second hour. This data point indicates the lowest temperature recorded during the High Temperature Tracking period. Once the High Temperature has been reached the temperature is tracked for the remaining portion of the second hour. This data point indicates the variation in temperature recorded during the High Temperature Tracking period (See graph above). At the conclusion of the benchmark's first hour the power consumption (kWh) is recorded. At the conclusion of the benchmark's second hour the total power consumption (kWh) is recorded. During the startup phase a sound reading is taken using the sound level meter. This data point represents a measurement taken with the sound meter adjacent to the sous vide machine. Note that the ambient sound at this location is 50 dB. During the startup phase a sound reading is taken using the sound level meter. This data point represents a measurement taken with the sound meter 12" (30.48 cm) from the sous vide machine. Note that the ambient sound at this location is 50 dB. I have put seven sous vide machines through their paces using the Sous Vide Machine Benchmark. The table below summarizes the measured and calculated results of those tests. As I mentioned above I ran the Sous Vide Benchmark on the Sous Vide Controller primarily to give a historic perspective on how far sous vide machines have come in a relatively small amount of time. The performance numbers of the temperature controller setup I used were clearly dreadful by today's standards. 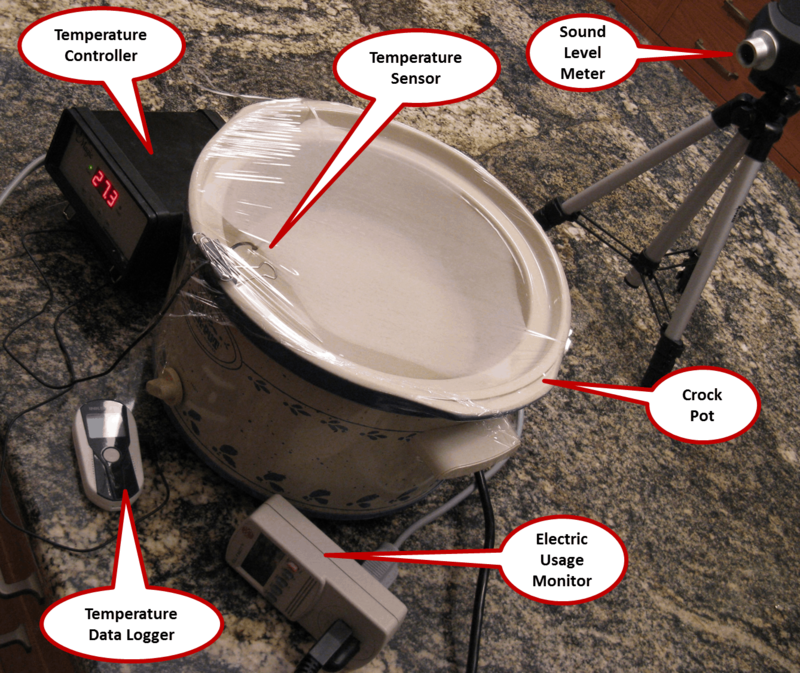 This is a function primarily of the crock pot capabilities rather than that of the temperature controller unit itself. Although I found the setup acceptable at the time, I am so glad that we have made major strides in sous vide equipment. Since the temperature controller sous vide machine is clearly an outlier, I do not include it in the remaining points. All of the sous vide machines did an excellent job of maintaining the water temperature in the bath. Although there were minor differences in the target temperature for each of the machines, there was only about a 1°F difference in all of the units. Moreover, once the target temperature was reached, the variation was limited to typically 0.2°F. Obviously, all of these units have the temperature accuracy required for any type of sous vide cooking. All of the units operated quietly. Of course the units without a circulator were essentially noise free. Standing next to the circulator units you could definitely hear them chugging along - typically around 10 dB above ambient. But as you move away just a little the noise level drops to less than a couple dB relatively quickly. Short of having one of these sous vide immersion circulators running next to your bed on a nightstand, I can't see how the noise would ever be a nuisance. All of the sous vide machines have relatively modest power requirements. They all draw less than 500 Watts which is relatively low for a kitchen appliance. For example, a coffee maker draws 800 W, a microwave 600-1500 W, and an oven around 2400 W. However, keep in mind that sometimes a sous vide machine will run for days at a time for a long cook. The startup times for all of the sous vide machines are relatively short and do not vary widely; approximately 15 minutes for the Room Temperature Startup Time and about 8 minutes for the Hot Tap Startup Time. It is clear that if you want to reduce your startup time then it makes sense to fill your sous vide machine with hot water from the tap. This can significantly reduce the length of time for the water bath to reach the target temperature. The PolyScience Sous Vide Professional Creative Series is the fastest of the sous vide machines to get to the target temperature. Unfortunately, it is also a much more expensive unit. The Sansaire unit was right on its heels at a significantly lower price. The purpose of the Sous Vide Benchmark was to provide some objective data on the performance of a number of popular sous vide machines. I hope this information will assist you if you are contemplating the purchase of one of these fine pieces of equipment. The bottom line of this testing is that any of these units would be excellent to use for sous vide cooking. Keep in mind that there are other factors that better differentiate these units from one another that we cover in other sous vide machine equipment reviews. It is important that you examine those factors as well before making your decision. If from your experience you have other information regarding the performance of these sous vide machines I would appreciate you adding it in the comments below. Thanks.